I was recently invited to evaluate a couple of baby products from XOve BABY. 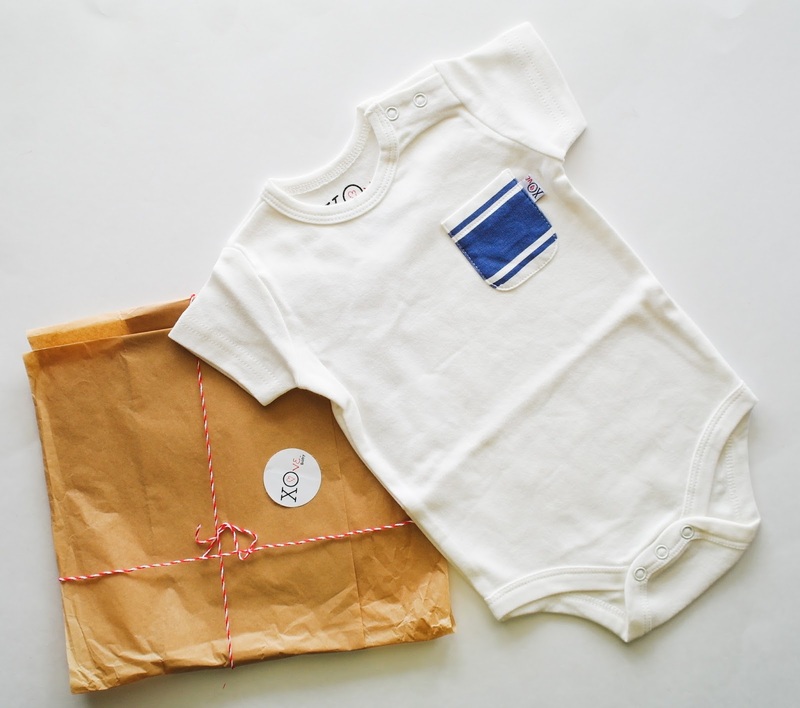 If you haven't heart about XOve BABY just yet, this is an amazing company that produces organic cotton baby clothing and matching bamboo muslin swaddle blankets. Not only are all their products gorgeous, high-quality and really good for your child (organic! ), the company also donates a brand new product every time one of their products is purchased - how amazing is that?! If you would like to learn more about why XOve BABY donates their beautiful blankets to children in need, or where their donations go, click on this link. I received three products for review purposes. All thoughts and opinions are my own. Comes in three sizes: 3-6, 6-9 and 9-12 months. This baby bodysuit is absolutely wonderful! I love everything about it. It's made of top-quality organic cotton that is incredibly soft and pleasant to the touch. The material is just the perfect thickness and it doesn't stretch in the laundry. The clasps are placed where they won't cause any discomfort (instead of the back, they are on the left shoulder). Someone obviously put a lot of thought into the design of this bodysuit to ensure optimal comfort for your baby. The tags are hidden in the front pocket - thank you! Finally someone is thinking! I can't stress enough how important it is not to have ginormous tags sticking out on the inside of a baby's bodysuit. They are hard to remove and they irritate the delicate baby skin. XOve baby made sure to keep the tags on the outside, in a spot that definitely won't bother your small bundle of joy. Our baby girl is 16 months old now, and sadly XOve doesn't have the size for her in their store (yet? ), otherwise I would have loved to get her a few of those. We got the size 3-6 month and ended up gifting it to a family friend who recently had a baby boy. She was very impressed with the quality of the material and the simple, yet very stylish design. Her baby boy just turned 3 months old and she says the bodysuit fits him well. It's a comfy fit right now, with some extra space to grow into. She says she prefers XOve Baby bodysuits over other organic brands, including Burt's Bees which is thinner and gets stretched easily. This is a truly gorgeous and amazing quality gift set for either a baby boy or a baby girl. We got the Glacier Gray in size 3-6 months (there are two more color options: Blushing Pink and Nautical Blue). The colors are neutral, the pattern is very stylish and can be matched with many different colors if desired. If you're looking for a baby shower gift for a couple who doesn't know the gender of their child yet, this is definitely what you want to get! The bodysuit is made of organic cotton and it feels fantastic to the touch - so silky smooth and soft! The swaddle is made of bamboo muslin that is equally amazing. The swaddle blanket is extra large and can be used for babies older than 12 months. It comes in handy during those hot summer nights when my daughter doesn't want to sleep under her regular blanket but still wants to be covered with something for comfort. It's light and thin, but very durable. Comes in three colors: Blushing Pink, Nautical Blue and Glacier Grey. This is my daughter's new favorite blanket. She's 16 months old now, so we don't swaddle her anymore, but when the days and nights get hot, she loves sleeping under a blanket that is light, soft and doesn't make her sweat at all. 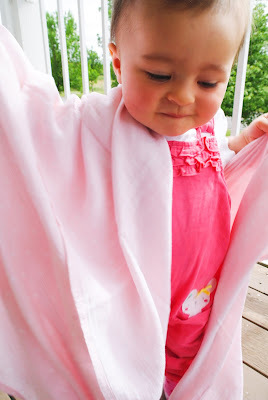 XOve Baby bamboo muslin swaddle is just fabulous. It really is incredibly soft and silky smooth, so nice to the touch, you just want to wrap it around your arms and rub it against your face. The design is very pretty. It's pretty much a classic polka dot (white dots against pink background). It's lovely. It's extra large, making this a multi-purpose blanket. It's thicker and more durable than the other organic brands we've used to date. 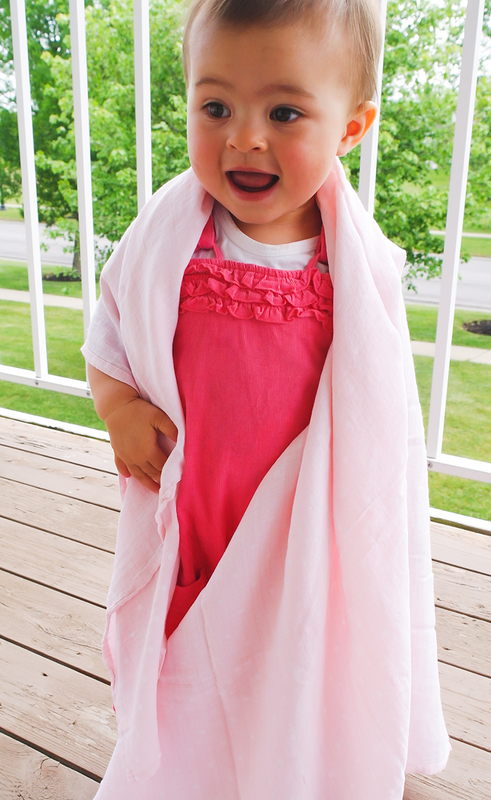 I can tell my daughter really likes both the soft material and the bright color of this swaddle. I highly recommend this product! Overall, I am very impressed with XOve Baby and their products. It is also amazing that for every product sold, a blanket is donated to a baby in need - that really means a lot. I wholeheartedly support this brand! Because I really appreciate XOve Baby sending me three of their gorgeous products for review, I am hosting a giveaway for $25 dollars Amazon Gift card in exchange for your support of the company!